No matter where you look on the internet, you’ll see the same things said about the Cedar Butte hike in North Bend. “Lesser-known” and “least visited” are common descriptions, but that’s normally followed by a list of awesome compliments. I’ve done the hike myself now, and I can officially say it’s a fun hike with a great view at the summit. The Cedar Butte hike is probably “lesser-known” because it’s not the easiest to find. You park at Iron Horse State Park (150 Lake Eastern State Park Road in North Bend) and make your way to the John Wayne Pioneer Trail (formerly the Chicago-Milwaukee-St. Paul-Pacific Railway). 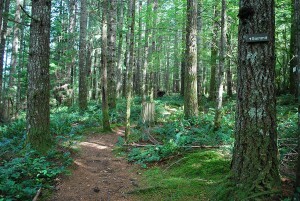 Walk east along the John Wayne Pioneer Trail for a mile to Boxley Creek. After crossing the creek (about 500 feet later), you’ll find the Cedar Butte trailhead on the right (marked by a wooden sign nailed into a tree). The Cedar Butte hike starts at 1,000 feet and climbs about another 900 feet to the summit (about two miles from bottom to top). Aside from a few short plateaus, you’re pretty much stomping uphill the entire way to the peak. 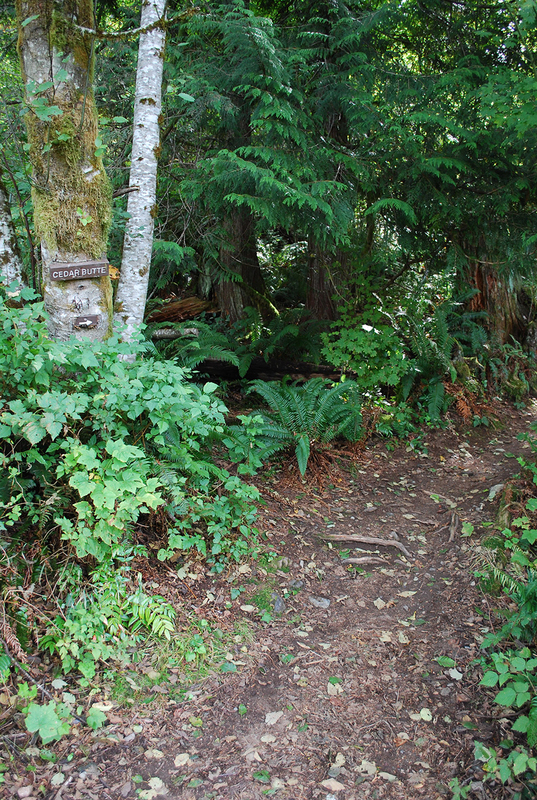 The Cedar Butte Trail is traveled enough that you can easily find your way through the woods, but keep your eyes peeled for signs. There’s a right turn required at one fork in the path (marked by a small white arrow nailed into a rock on the ground) and then you have to take a left toward the summit at Saddle Junction. 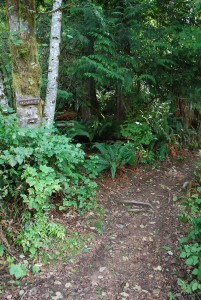 The Cedar Butte hike takes you on a meandering path through the woods. You honestly get away from everyone and everything. I bumped into two guys on the trail and they were stunned anyone else was out there. Yes, that’s how quiet the Cedar Butte Trail is. The air is fresh and you can hear nature (flowing creeks, singing birds, etc.) all around you. The best part of the Cedar Butte hike is what you put in all the work for — the summit. 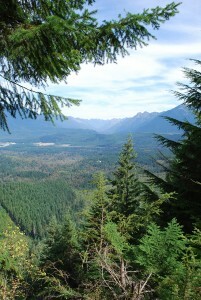 There’s a great view (a little obstructed by growing trees) of the Snoqualmie River Valley. Looking north, you can see several local peaks and mountains, miles of forest, and the traffic cruising along I-90 in the distance. It’s a very peaceful setting, especially when you’re up there all by yourself. There are a couple other fun views near the Cedar Butte summit that you don’t want to miss. I was so committed to climbing to the top, I honestly didn’t notice them until I was heading back down the trail. 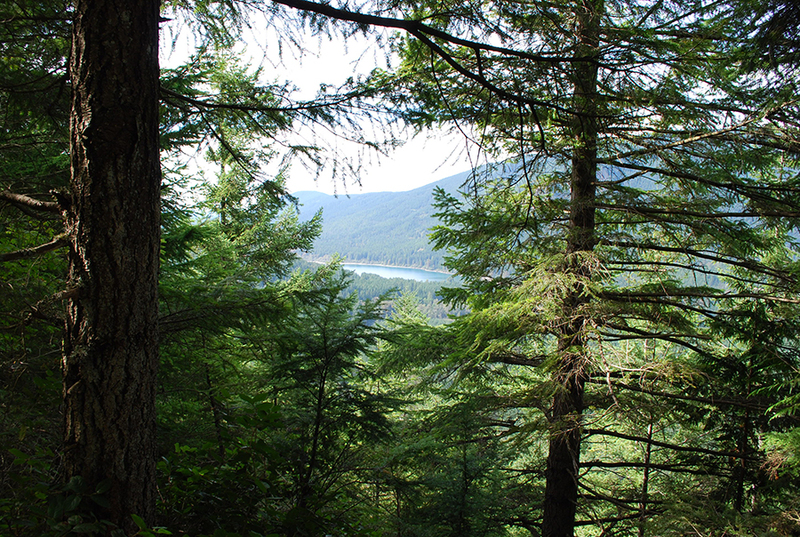 The best view of the bunch allows you to see Rattlesnake Lake in the distance through a gap in the trees. The Cedar Butte hike is one of the “least visited” trails in the Snoqualmie Pass corridor (Rattlesnake Ledge and Mount Si are much more popular), but you really shouldn’t miss it. 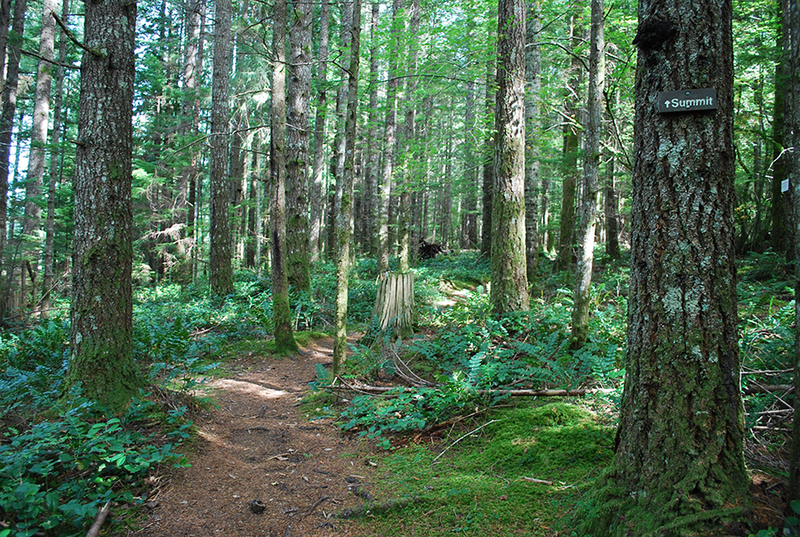 Located only about 45 minutes (depending on the traffic) from Seattle in North Bend, the Cedar Butte Trail offers a great year-round day hike. You get a nice workout and a cool view, and it only take a couple hours of your day. Have you ever done the Cedar Butte hike? How was your experience? What did you think of the view at the summit? We’d love to hear from you! Please leave your comments below or connect with us on Twitter, Facebook and Google+. 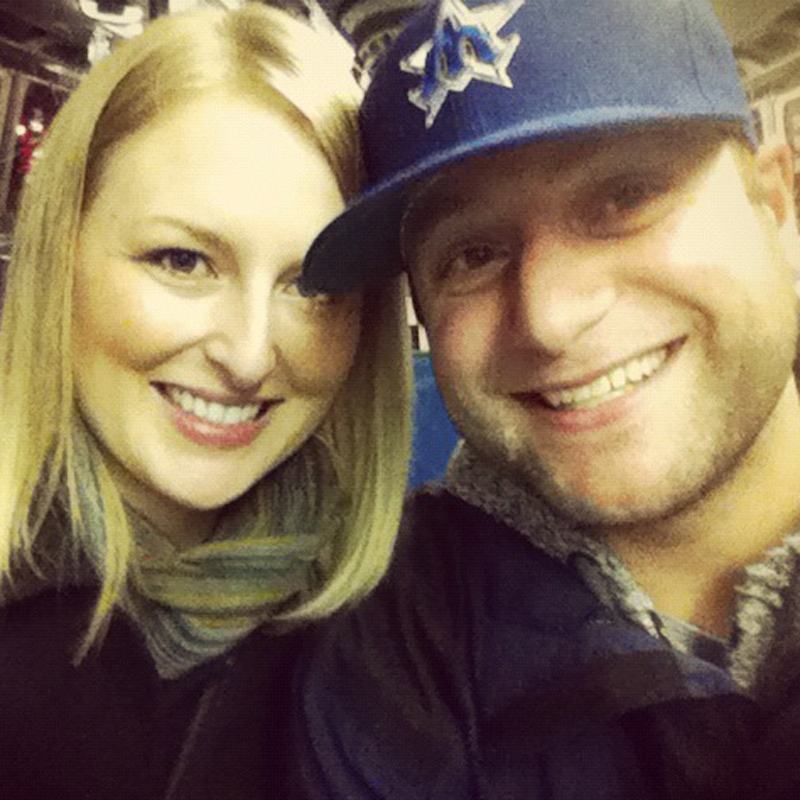 Don’t forget to also check out Seattle Bloggers for more fun activities around the Puget Sound! Thanks for leaving a comment, Rachel! Cedar Butte is a beautiful hike. You should definitely check it out sometime. We’d love to hear what you think of it. P.S. We just had a chance to look at your blog. Great stuff! Who knew Lake Easton State Park was so awesome?! Keep up the great work!